The dream can now become a reality, but it will only happen for one woman. 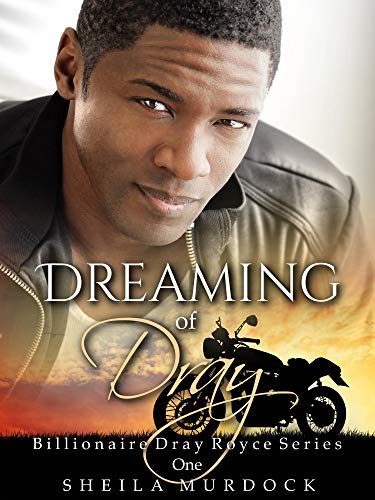 Today's Billionaires & Bad Boys recommendation, Dreaming of Dray, is a full of drama, lust and romance. There is certainly a lot more to Dray than what you'd first expect. And we can't wait for you to find it out for yourself! Grab your copy now for just $2.99 or FREE on KU! Billionaire bachelor Dray Royce is looking for a wife, and women all over the world compete for a chance of a lifetime to become the one for him. But Eve Lyle, and other women, have no idea just how out of control things will become in the quest for this billionaire's love, especially when he makes his choice on who will be the one for him. Sheila Murdock is a combination of her birth name and her late grandmother’s maiden name on her mother’s side. Dreaming of Dray is her first African American romance book and is the first in the Billionaire Dray Royce series. When she’s not writing, she enjoys watching TV shows, and can never miss an episode of How to Get Away with Murder, Greenleaf, and Mr. Mercedes. She also loves the Smithsonian, OWN, ID- Investigation Discovery, Hallmark, and TV One channels. She also enjoys reading all kinds of non-fiction, but has a particular interest in African-American historical and contemporary non-fiction, but will read an occasional fiction book. She enjoys listening to old-school/throwback rap, hip-hop, and R&B, and jazz music from any era, and tries to make it to every concert that comes to her city, Las Vegas. You're recieveing this email because you signed up to BrazenBookshelf.com's Billionaires & Bad Boys newsletter. You can change your settings at any time by clicking the "Change my subscription settings" link at any time.